Necesito una cámara. Necesito una cámara, pero tengo mis palabras solamente. Solamente palabra después de palabra para expresarme. No hay una fotografía con mi cara, con mis manos, con mis pies. Pero, están mis palabras. Y puedo usar mis palabras como una fotografía. Te describo. Me describo. Sin un espejo, mis ojos son tuyos. Ciegos. Pero, nuestras ojos son tuertos solamente. Un ojo puede ver. Puede ver mis palabras. ¡Mira! ¡Mira! Mis palabras son tus ojos. Tus ojos son mis ojos. +most days (mainly when i have dance) i sit or stand on the subte (subway) and gaze away into an imagined world. the man next to me is reading crimen y castigo (crime and punishment). i smile. knowing that i too have read the great work. this man, dressed in a suit, like all men out of college, sits entranced in the russian world of a killer. +most days i walk to school. 22 blocks. down coronel diaz and onto santa fe then a final trek down riobamba. each day i get to become part of the mob. in this big city so much to smile at while walking a mere 22 blocks at 10am and again around 4pm. walking at pace to my ipod-provided background music to my life. drift into deer eyes of wonderment. i am now a city gal. loving people surrounding me, taking me in and giggling as i do the same in return. exchanging no words but shared emotions. a unit that marches and crosses at stoplights waiting for the orange (yellow i suppose). once it flickers, march on. where to? make up your own stories. who am i to them i wonder. a student? a worker? an artist? a shopper? there on riobamba is the man. the man who works at Moratto, the helado (ice cream) shop. each day as i walk to class, he catches my eyes. at first it was just a widening of the eyes and a smile. now we wave. today he was sweeping outside. we waved and said hola. then back to my path to school. nothing more. +only in argentina…last night i got out of painting class 2 hours early because i have class in the neighborhood of La Boca, which is also home of the La Boca soccer team and stadium. there was a game last night. and when it let out, it would be very dangerous. so we were sent home early. pack up and go. the soccer fans are crazy here. google them. it is ridiculous. +staring. is. okay! being blondeish in a society of dark features is exotic. and beautiful. men here are bold and blunt. staring is natural. comments are even more natural. taxi drivers’ eyes wander away from the road for just enough time to make me laugh out loud. oh argentines. +subte daze. what happens to me when i am riding to dance. i people watch. i read. i miss my stop. then have to walk 5 blocks back the other direction to get to where i need to be. moral of the story…watch the signs. +mate mate mate. yerba mate is a tea. 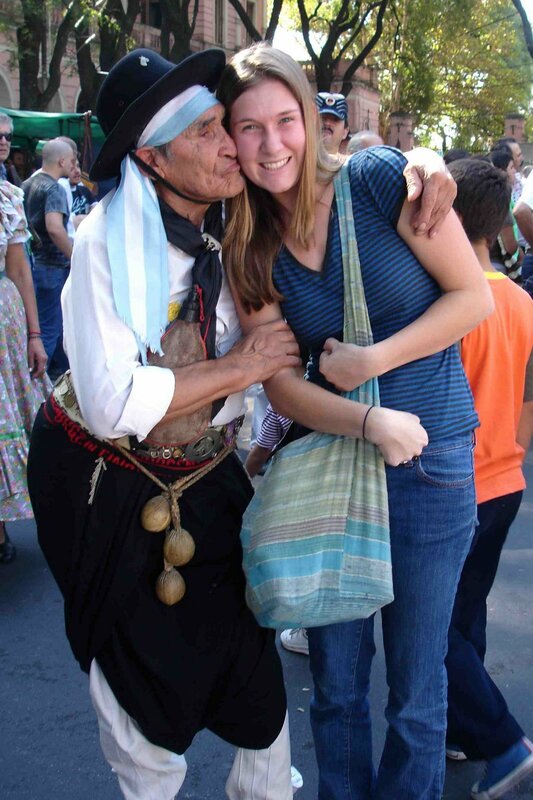 it is a culture in argentina. every social event has mate. you fill a “mate” or a hollowed out gourd with “yerba” or loose leaf tea and then pour hot water in it and sip out the water with a “bombilla” or a metal straw with a built in filter. you drink one cup then pass it back to the mate owner then they fill it back up and you pass it to the next person in the circle. yum yum yum. i just bought a mate made of wood with a sunflower carved into it. +5am nights. argentine life starts and ends late. my weekend: a bar called Jobs that had pool tables, board games, playstation, and archery…yes archery. alcohol and archery just doesn’t seem like a good idea. then a milonga (tango hang out). a reggae bar with singing and jamming waiters. an improv comedy show (see below). 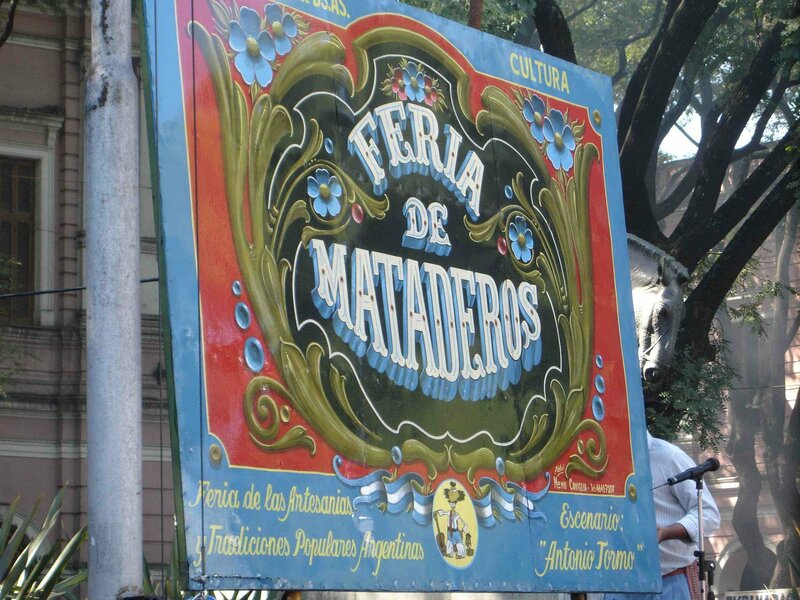 and lastly the feria de mataderos (see below). fun fun fun. i sleep a lot instead and opt out of the nightlife scene. although theater and shows don’t start until 10pm either. +the smoke. there were recently accidently forest fires in the provencia (outside the city), about 30-50 miles away, and the smoke engulfed the city. you could not see in front of you. you smelt like campfire at all times. your lungs hated you. but i can see clearly now, the smoke has gone. sunny and 70 again without a haze of death. +mcdonalds is just better here. improv comedy show: a friend and i ventured to this show, in spanish. we had to write down original titles. there were two teams of comedians. we voted on titles from the audience and then the comedians had to act out that title in different styles (opera, slow motion, rhyme, science fiction, soap opera, etc.). then the audience voted on which team was better. i understood maybe 75% and it was hilarious. the judge was also a transvestite with stop sign read hair wearing a one piece leather jumpsuit. super great. 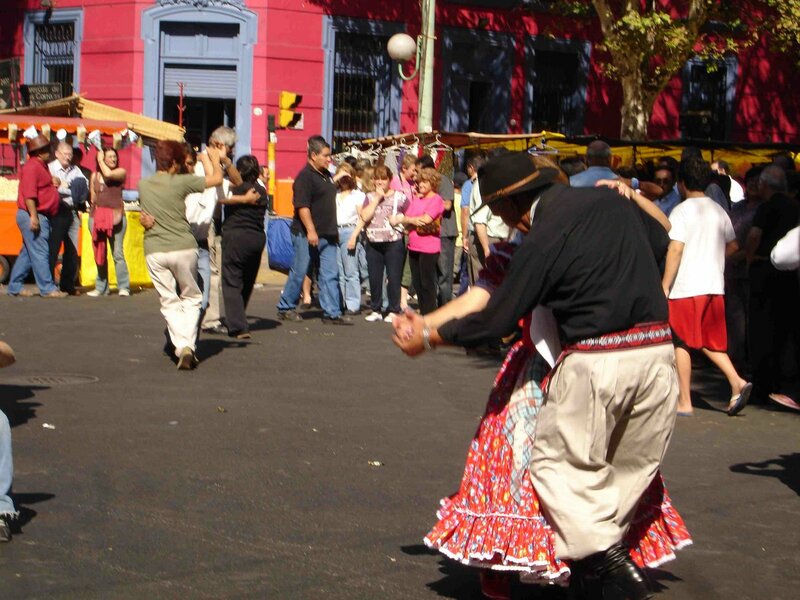 feria de mataderos: (SEE PHOTOS ABOVE) this is a market about an hour outside of buenos aires. it has live music and dancers and tons of crafts and clothes and jewelry and food and amazingness. 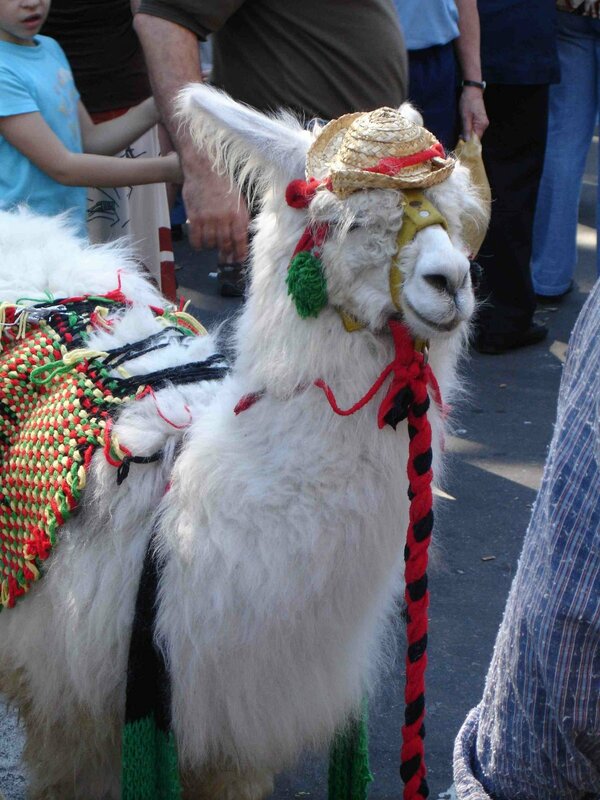 it is the gaucho fair. the real authentic “cowboy”-esque argentines. we had choripan (sausage) and bought some great things for very cheap. also, film festival: there was a two week long independent film festival that was only 4 pesos (around $1) to see films. i saw some great ones. one about the andy warhol factory. another about argentine rock star, sumo. i am sad it is over, now back to expensive movies, 18 pesos ($6). my classes are going great. i will post some of my paintings when they are finished. we have midterms next week and then break. i am going with my friend mia to salta and jujuy (northwestern argentina) and then to mendoza (western-central argentina) and then to santiago, chile to visit kelly! should be a blast and a nice and welcome break from MI VIDA NORMAL. This entry was posted in argentina.. Bookmark the permalink.